What Does It Mean When Dogs Smile? Did you know that just like us humans, our dogs can suffer from bad breath, dirty teeth, and inflamed gums. It is important that they receive the best care for their dental health as they can’t clean their teeth themselves like we can. Naturally, as the dog owner, it is your responsibility to take care of their teeth. Also, one of a dog owner’s many mistakes is not keeping up with their dog’s grooming – and keeping their teeth clean is part of that grooming process. So how do you cure a dog’s halitosis or weak gums? Bad breath in dogs can occur when they have swollen gums. This is a result of bacteria forming when the plaque or tartar on your dog’s teeth and gums are not removed regularly. This can then, in turn, lead to gum disease and complications with the heart and liver. By brushing your dog’s teeth regularly, you eliminate these risks. Dogs, although they have no control over the matter, can tend to have bad smelling breath. Not only does toothpaste get rid of bad bacteria and whitens their teeth, but it also gives them nice smelling breath that you won’t try to avoid when you give them affection. *Try to find a toothpaste with parsley extracts in it, as this works best in counteracting the smell. 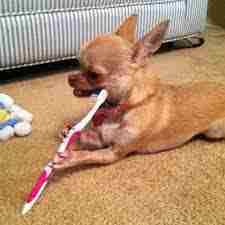 By brushing your dog’s teeth with toothpaste regularly, you are also improving their overall health. Bad bacteria, as talked about above, can result in a build-up of plaque and tartar. Not having their teeth cleaned can not only cause diseases and problems in the teeth but in the vital organs of your dog’s body. Unfortunately, your dog can be prone to disease in the teeth and gum if they are not well looked after. Gingivitis is an inflammation of the gingiva (part of the gum around the base of your dog’s teeth), and Periodontitis is the inflammation of the gums and the structures that support the teeth. These result, as well as many other gum diseases, are from a build-up of plaque and tartar. By brushing your dog’s teeth with toothpaste, you are helping to reduce the risk of such diseases and prevent plaque and tartar. Also, according to WebMD, more than 80% of dogs by the age of 3 will have some form of periodontal disease. 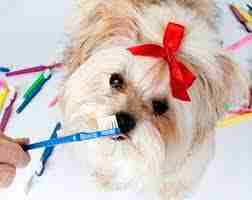 Many dog owners believe normal human toothpaste, such as Colgate, can get the job done on their dog’s teeth. This can be very harmful to your dog, so it is important to recognize that you should not be using it to clean your dog’s teeth or eliminate their bad breath. The majority of human toothpaste contains fluoride, which can be extremely poisonous to dogs. It can cause severe vomiting and in some cases, liver damage. If you want to brush your dog’s teeth, it is recommended you use dog toothpaste or toothpaste that you can make using natural remedies. Baking powder is a great way to add gentle granules to your dog’s dental cleaning regime. Using this with beef bouillon for flavor, a pinch of salt, and dried or fresh parsley for fresh breath, this is a DIY toothpaste that your dog will love. Turmeric is an all-around herb for your dog with a number of recorded benefits. In terms of your dog’s teeth, use a natural base of coconut oil to start your mixture. Add turmeric to whiten your dog’s teeth, parsley to act as an antibacterial agent, and kelp to remove the nasty plaque from your dog’s mouth. Coconut oil is a good way to maintain your dog’s pearly whites after getting rid off all the nasty bacteria on their teeth and gums. To get rid of your dog’s bad breath on top of this DIY toothpaste, add some parsley oil. If you are looking for the vet’s stamp of approval regarding dog’s toothpaste, then they highly recommend advanced enzymatic toothpaste. Advanced enzymatic toothpaste has been designed to specifically target the areas of plaque buildup by removing and preventing it, as well as fight tartar, whiten your dog’s teeth, and eliminate bad breath. Brushing your dog’s teeth doesn’t have to be a hassle. There is a simple method that will alleviate the fuss and allow your canine to have nice smelling breath and sparkling white teeth. Place your hand over your dog’s muzzle from above. Gentle and slowly squeeze and push his/her lips up on one side. Tilt his/her head back slightly so that the mouth naturally falls open. Brush your dog’s teeth gently. If your dog begins to resist, stop until they are calm and try again. TIP: It is easier to brush your dog’s teeth after exercise, as they are more inclined to relax and keep still. Introduce the toothpaste to them gradually so they become familiar with the procedure of getting their teeth brushed. Focus mainly on the gum line, as this is where bacteria and food mix together to form plaque. Always move the brush in a circular motion. Hold the toothbrush so that the bristles are at a 45-degree angle. Speak to them during the process to keep them calm. 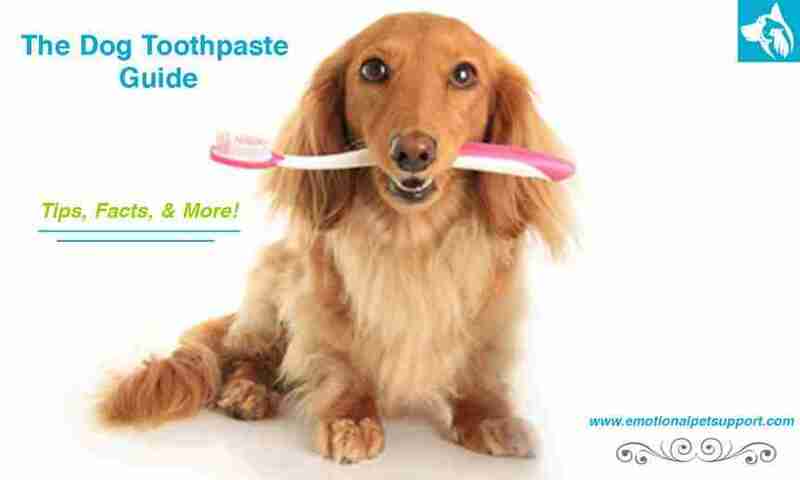 Dog toothpaste is an overall benefit to not only your dog’s teeth but to their overall health. Eliminate bad breath and dirty teeth, and prevent your dog from ever having to suffer from dental diseases they may face over the course of their life.